It's hard to stand out in the crowded domain conference field so Patrick Ruddell (ChefPatrick.com) knew he would have to do something different when he decided he wanted to put together an event of his own. 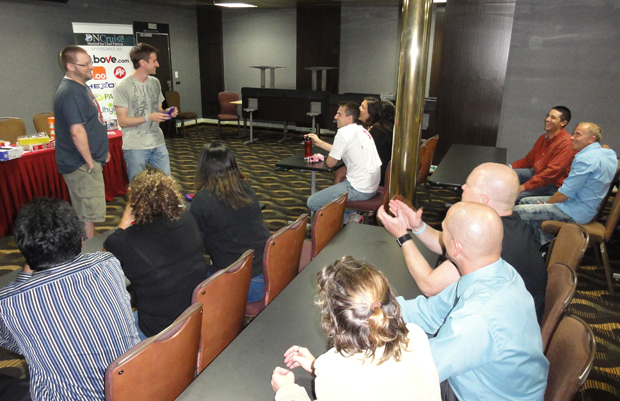 His solution was to stage the first domain conference ever held on a cruise ship - DNCruise - an event that ran Oct. 11-15 aboard the Carnival Imagination. Bahamas Thursday, Oct. 14) hosted DNCruise. guests along for the ride. The itinerary called for stops in Key West and Cozumel, Mexico, but Mother Nature had other plans, sending Hurricane Paula our way along with a new port of call. More on that in a moment. 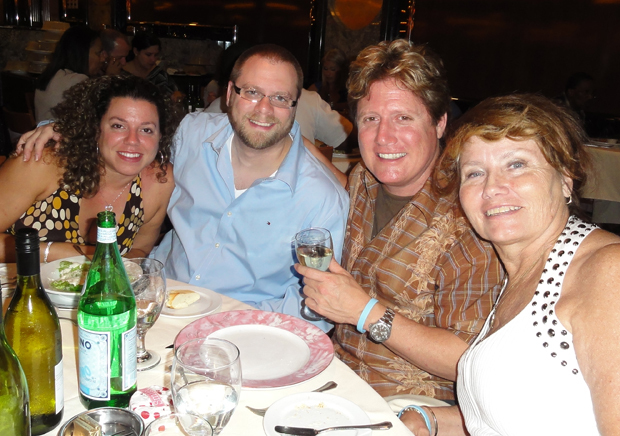 The more important thing to know is that the passing storm failed to dampen the spirits of the domainers on DNCruise. An hour after the ship left Miami under sunny skies, the first conference event, a welcoming cocktail party, got underway in the Illusions Lounge on the 9th deck of the Imagination. Chef Patrick was there to welcome guests with a huge DNCruise ice sculpture serving notice that his was going to be a very cool event. 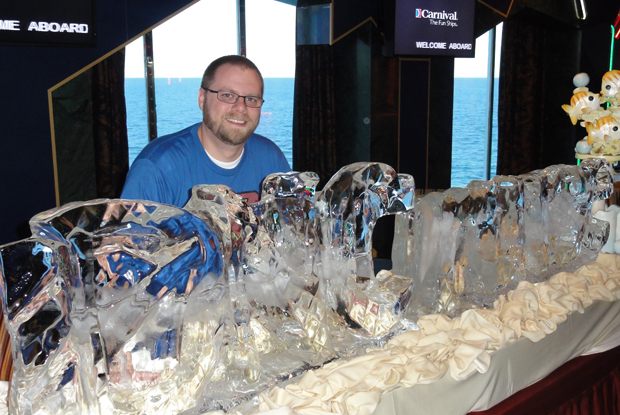 Above: Host Patrick Ruddell (Chef Patrick) keeping his cool behing the DNCruise ice sculpture. of the guests were attending their first domain conference). 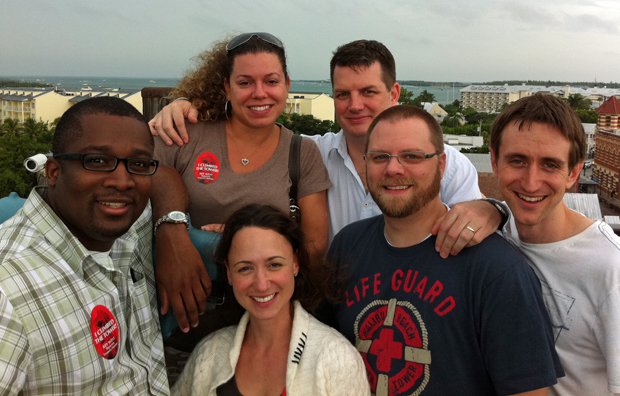 It didn't take long for the DNCruise registrants to become one big happy family. Everyone dined together at 8:15pm each night. Guests could switch tables each evening so they could spend time with a wider variety of fellow domainers during the four-night cruise. After dinner every night, the maitre d' and waiters cajoled the diners into closing out the evening with an impromptu song or dance. In the photo at right, the first ladies of ccTLDs; .ME's Natasa Djukanovic (at left) and .CO's Lori Anne Wardi, show one of the waiters how to really cut a rug. 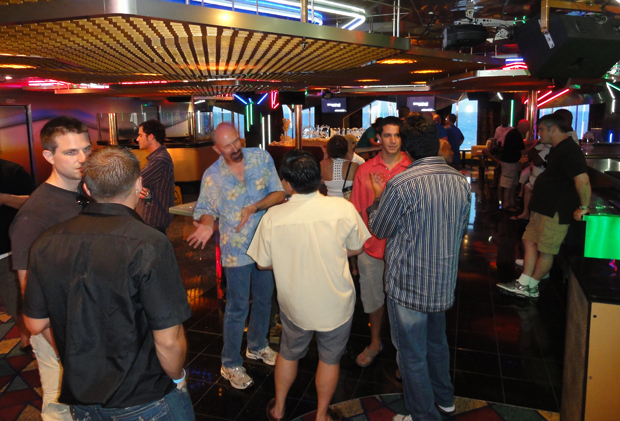 One of the best things about the casual cruise atmosphere is that everyone let their hair down and could feel comfortable just being themselves. It produced a great environment for getting to know each other better than would have been possible in a more formal setting. Day two of DNCruise opened with the Imagination docking early Tuesday morning under rainy skies in Key West, Florida. It turned out that a much bigger storm was brewing across the Gulf of Mexico in the exact location we were supposed to go next. Shortly after I woke up I got a text message from Michael Castello telling me Hurricane Paula has unexpectedly formed off the Yucatan Peninsula and was headed straight for Cozumel. 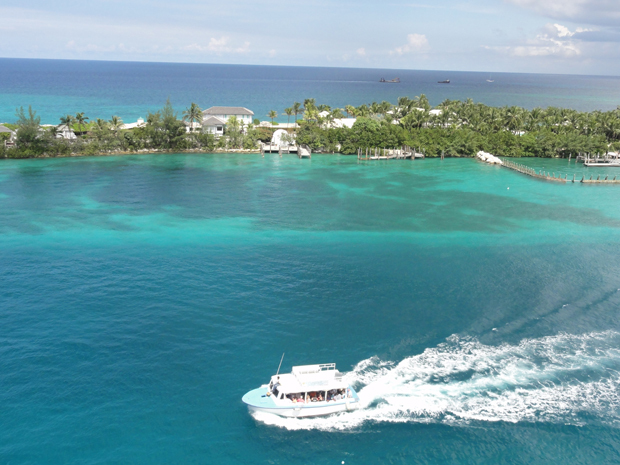 While the captain kept an eye on the weather reports, some of the domain cruisers, including Michael, decided to go into Key West despite the downpour. My wife, Diana, and I decided to stay onboard but Michael sent me some photos from shore. 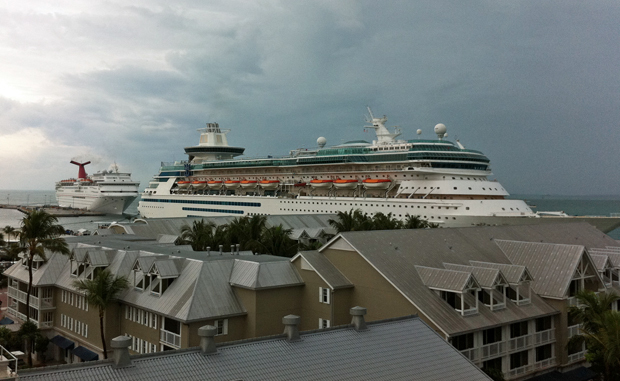 one at left) docked at Key West in this photo snapped by Michael Castello Tuesday (Oct. 12). Morgan Linton, Patrick Ruddell and Jodi Chamberlain. Everyone had to be back onboard by 2:30pm Tuesday. Soon after that, the captain announced that with a hurricane bearing down on Cozumel we were going to turn around and head the opposite direction with Nassau, Bahamas as our new destination. With the Imagination now headed east, the conference resumed with a networking session Tuesday afternoon. I really liked the way this one was handled. 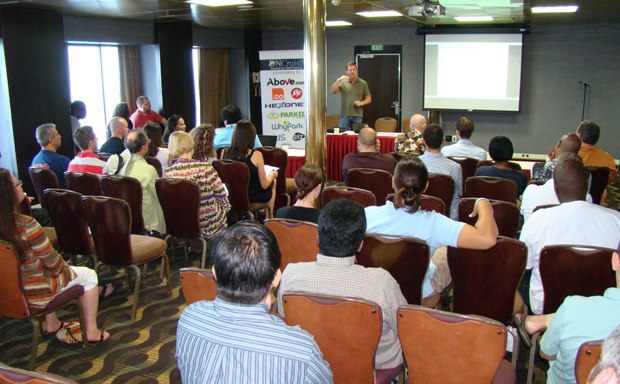 After making some opening comments Chef Patrick (while shedding a few tears of joy at seeing his DNCruise creation come to fruition) introduced the event's sponsors, then had every attendee step to the front of the room, one by one, to introduce themselves and tell the crowd how they got involved with domains. Time would prevent this from being done at a conference with hundreds of attendees, but it was perfect for a smaller gathering like this because it allowed you to learn something about every single person there. 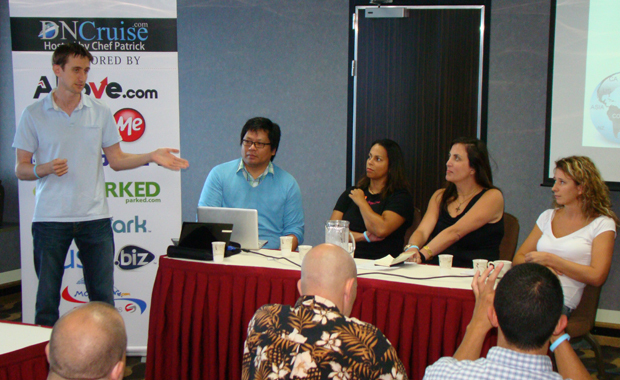 It was especialy interesting to hear how they arrived in this business and why they shared your own passion for domains. hitters, but the many newcomers on DNCruise were meeting him for the first time. Michael Castello and I had been scheduled to conduct an open forum discussion after the networking session, but since each of us had already spoken at length during the individual introductions we called an audible and opened that time for everyone to chat one on one. Having just heard some remarkable stories many of us wanted to learn more from the people whose accounts particularly intrigued us. After dinner, Chef Patrick introduced another new wrinkle to the conference game - a Game Night - in which attendees chose up teams and competed head to head in a variety of old school games with a load of cool prizes up for grabs (including a Macbook Pro, Ipods, a free cruise, cash and more). for Taboo to the teams that were ready to go head to head on Game Night. 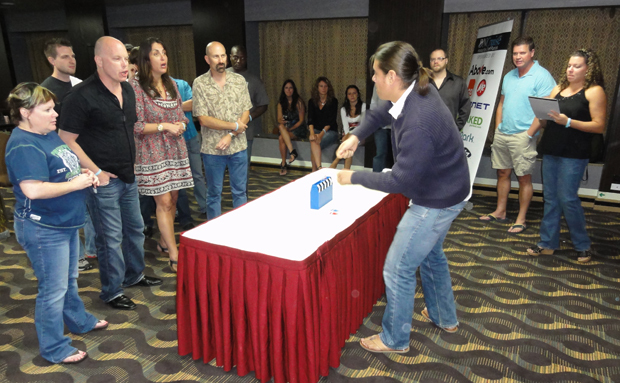 Game Night turned out to be a big hit with participants who raved about the networking and team building experience. It went over so well that Patrick scheduled a second game session for the final night of the cruise. Day 3 of DNCruise (Wednesday, Oct. 13) was a Day at Sea (the Imagination would not arrive in the Bahamas until Thursday morning). With the weather still iffy that made it a perfect day for a full round of seminars covering a broad range of domain topics. Craig Snyder, the General Manager of Oversee.net's Registrar and Aftermarket divisions (including Moniker and SnapNames) kicked things off at 10am with a detailed discussion of the Drop Game (covering the stages that expiring domains go through before they become fair game again). on the domain Drop Game Wednesday morning (Oct. 13). This was the first time I have heard Craig speak at length and it was a revelation. The U.S. Naval Academy graduate did a great job of making a very difficult subject understandable, even for the newcomers in the crowd. He also showed tremendous grace under fire. The audience peppered him with questions throughout his presentation, something that few speakers can handle well. Questions are normally held until the end so a speaker does not lose his train of thought or have disruptions shatter the presentation into dozens of no longer recognizable pieces. For Snyder, it seemed to be a piece of cake though. He adroitly addressed every question while still managing to keep the overall presentation on track. A thought that crossed my mind after his session was that everyone who paid $400 to be on the cruise got their money's worth from Craig's valuable session alone. I hope Oversee will utilize his obvious talents at their next DOMAINfest Global conference in February 2011. The industry needs more people like this who can make an arcane subject like domains less of a mystery to the mainstream business world. The morning continued with three more seminars. 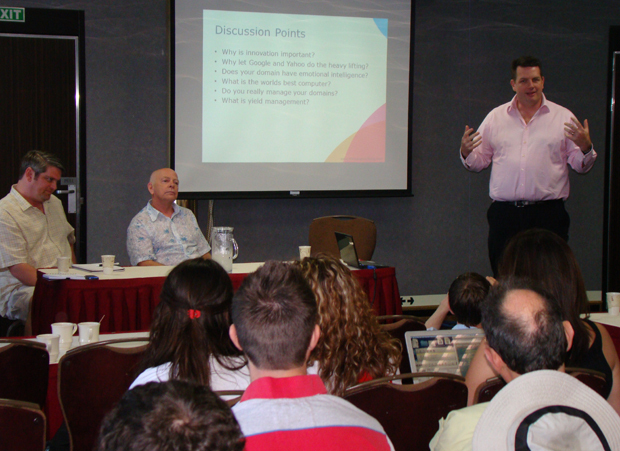 Next up was a panel discussion on the rise of ccTLDs. (.CO Registry), Lori Anne Wardi (.CO Registry) and Natasa Djukanovic (.ME Registry). 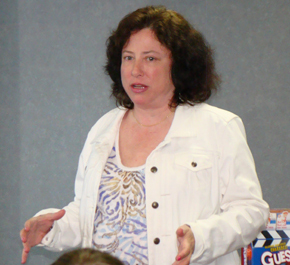 Batting third in the morning line up was attorney Karen Bernstein, who has clients raving about her expertise on domain and trademark related issues. She was followed by an all-star panel that covered domain parking and alternate methods of monetization. That session, moderated by Parked.com's Michael Ward, featured (left to right in the photo below) Donny Simonton, (President, Parked.com), Gregg McNair (PPX International) and Dan Warner (CEO, DomainAdvertising.com). People could drift in and out of the conference sessions to grab a drink or relax on the deck of the Imagination (shown the in the Wednesday photo below), but attendance for the seminars was quite high, likely fueled be the large number of newcomers who were determined to absorb all of the information they could get about how to succeed in the domain business. After a lunch break it was time to get back down to business with four more seminars Wednesday afternoon. Morgan Linton kicked it off with a talk about website development, his preferred method of monetization. 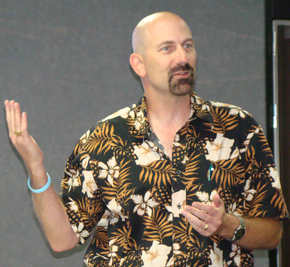 Rick Waters followed with more details about site development and successful SEO practices. 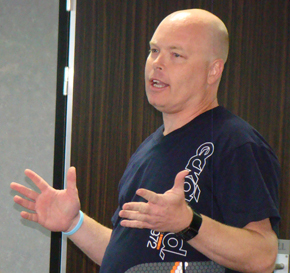 Brad Waller, a expert on mobile apps was next with tips on adapting to an increasingly mobile environment. David Sams, a world class TV producer who helped launch syndicated classics like Jeopardy, Wheel of Fortune and the Oprah Winfrey show, closed out the business day with an inspiring talk about online marketing and video. At least, that is how it was listed on the agenda. It was more about dreaming big. It is something Sams has done throughout his life while following one key principle - don't let anyone tell you NO or that something you dream of doing cannot be done. He pointed out that in the media world, the gatekeepers who used to be in control, have been washed away by the Internet. Now everyone has ready access to low cost worldwide distribution platforms in domain names. 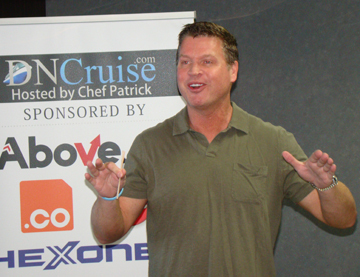 David Sams delivering an inspiring talk in DNCruise's final business session. 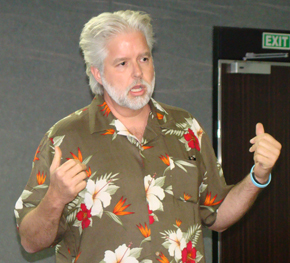 David's talk provided a fitting end to DNCruise's seminar program. Chef Patrick returned for some closing comments (during which he thanked his wife Zezura for pitching in and helping him pull off a very successful debut event). He and Zezura also surprised five attendees who were celebrating birthdays by rolling out a cake for them, as well as one celebrating the birth of DNCruise. Above: Birthday cake helped give the business portion of the DNCruise agenda a sweet close. 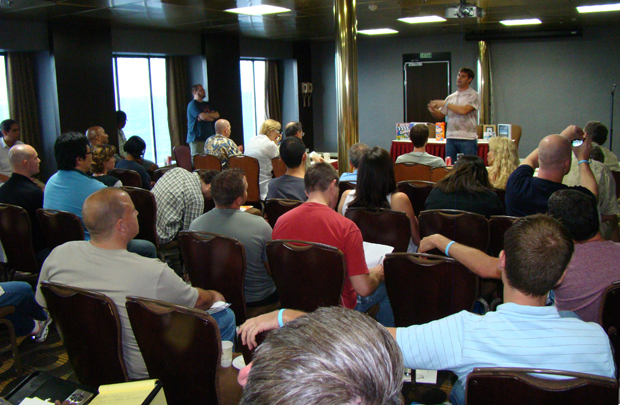 The business sessions were over, but the fun was just beginning on DNCruise. Gregg McNair, the Executive Chairman of PPX International, saw to that. After dinner McNair, the most energetic person you will ever meet in your life, opened the door to his spacious cabin to all attendees for a late night party that brought day 3 to a rousing close. Gregg McNair is a one-man party. Gregg brings a smile to the face of everyone he meets. 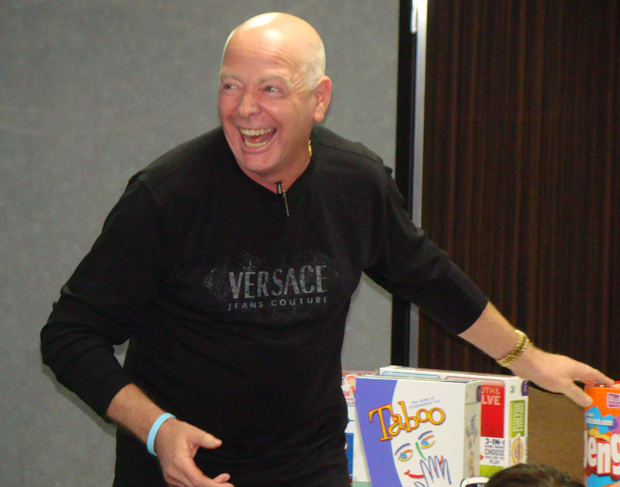 night parties, Gregg's enthusiasm and good humor will leave you feeling like a million bucks. Day 4 of DNCruise (Thursday, Oct. 14), a day of leisure, opened when the Imagination docked early that morning in Nassau, Bahamas. 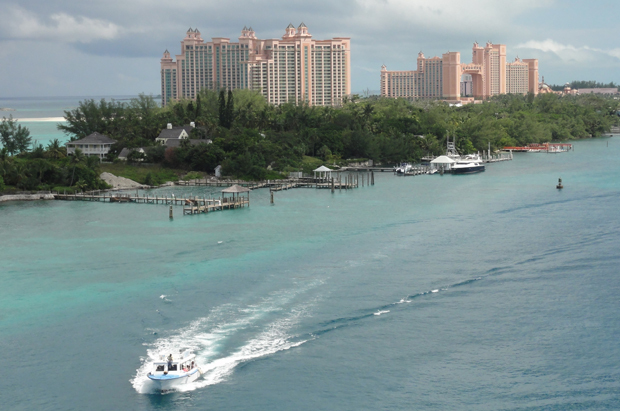 Some attendees made the short walk into town to explore Nassau. Others took a taxi ride to the fabulous Atlantis Resort (where the Domain Roundtable conference will be held in March 2011) and others elected to stay on board and enjoy the beautiful day lounging by the pool or enjoying other activities on the Imagination. 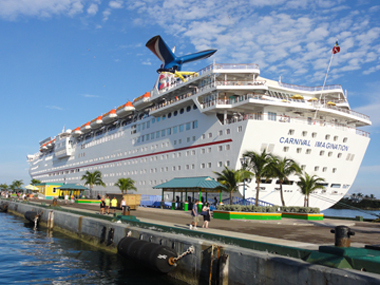 of the Imagination whle it was docked in Nassau Thursday (Oct. 14). located just across the channel from the cruise ship docks. 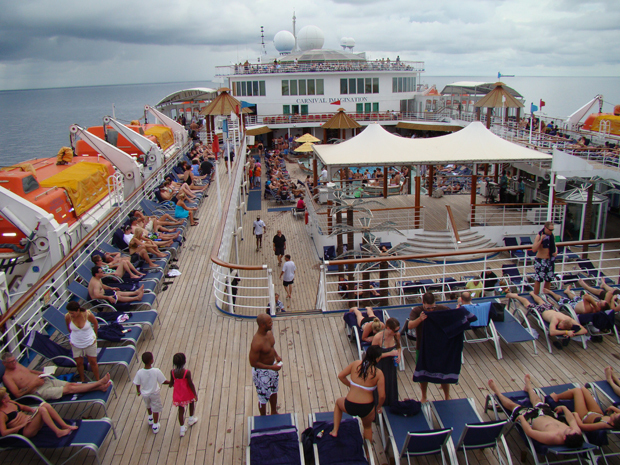 Everyone was back onboard by late afternoon when the Imagination departed Nassau for the final leg of the cruise back to Miami. After dinner that evening, attendees enjoyed another Game Night in the last group event on DNCruise 2010.
similar to charades, that generated a lot of fun Thursday night (Oct. 14). The Imagination cruised through the Atlantic throughout the night, bringing us back home at 8am Friday (Oct. 15). As we disembarked, we said our final goodbyes to old friends and the many new ones we made during DNCruise. People were already talking about when they could do it again. Chef Patrick undoubtedly already has the wheels in motion. He said he is aiming for a 2011 event that would likely be held next July with the cruise moving to the West Coast for a Los Angeles departure. If you are looking for a new kind of conference experience, DNCruise's maiden voyage showed that you can depend on Patrick and Zezura to deliver it. 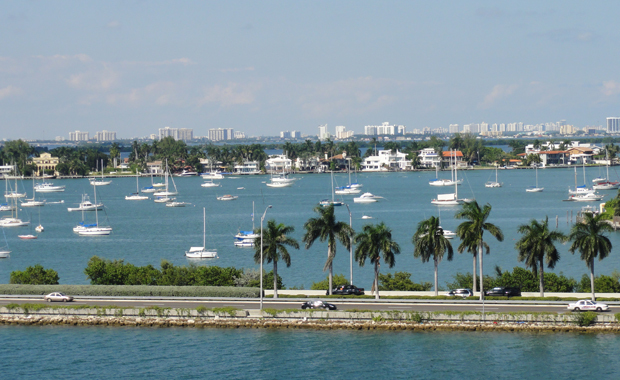 A view of Miami from the deck of the Carnival Imagination on DNCruise 2010.